I know this doesn't look like anything special. But the flavor, oh-my-goodness the FLAVOR! Chai + Chocolate = Genius. I got the idea from Chocolate Covered Katie (love her site) but fiddled with the recipe a bit. I also had a Chocolate Chai Latte at Starbucks not too long ago so you can bet I'll be making a version of that for ya'll soon! Steep the chai in the boiling water for 10-15 minutes to get some good flavor in there. 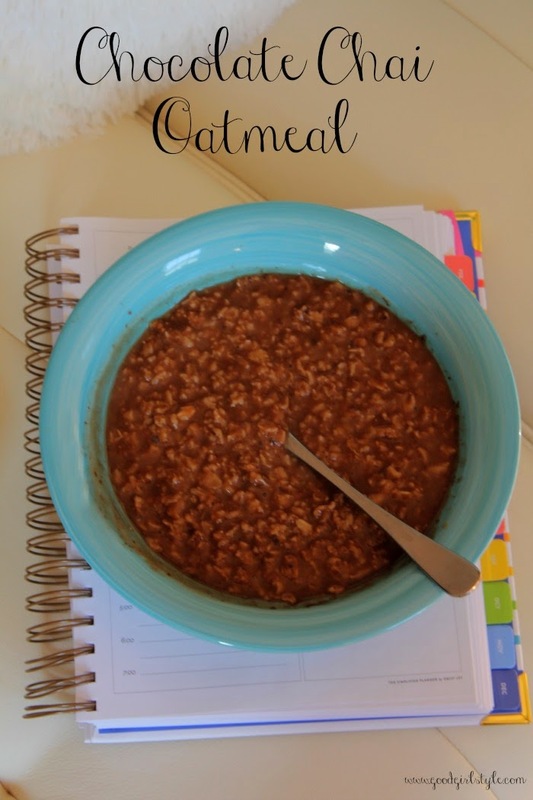 Remove the tea mix or bag and add the brewed chai to the rolled oats and milk in a large bowl. Add the pinch of salt and the sugar. Microwave for approximately 3 1/2 minutes. Let stand in microwave for 2 minutes. Stir in the cocoa powder and top with a few chocolate chips if you have them handy. Enjoy! LOVE this. It puts the oatmeal I had this morning to shame (same old PB and jam combo, wah wahhh). Trying this tomorrow!